I don’t have any quantities, just go with your instinct, because nothing goes to waste; whatever is left over, can go right back into the fridge or eaten right there while you’re preparing. 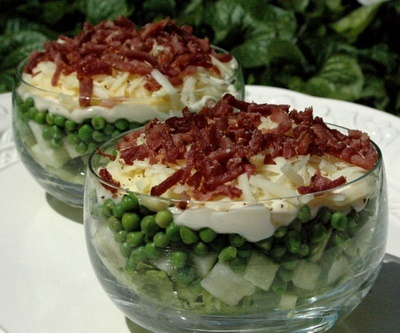 In a glass salad bowl, layer the salad by starting with a layer of torn salad leaves at the bottom. Follow up with the cucumber cubes, then the apple cubes, a thick layer of petit pois. Mix the mayonnaise and Kraft salad dressing to taste and add a well coated layer on top of the petit pois. Cover with the grated cheese and end with a sprinkling of crispy bacon pieces and lemon pepper. You can use a big glass bowl or as in the photo above, individual glass bowls. Another option is to serve it as an amuse bouche, using a serving ring (about 9cm) to assemble it. (Picure below). 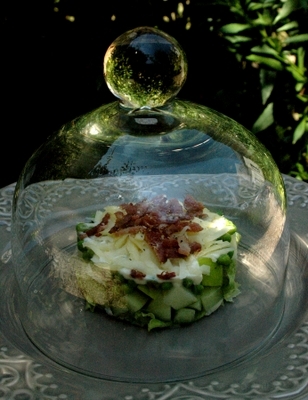 It can be done ahead of time and be served, ready on the plates, covered with a cloche, when your guests arrive for lunch. Looks FABULOUS!!! When can I come over??? –>I remember that salad… we haven’t had that one for ages Mum!!!! Pity I just had lunch, or I would definately be having that!!!! 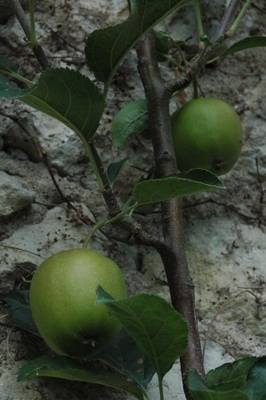 –>Salut Marinell…if you weren’t such a jetsetter, you could’ve had a taste of it here at home..hiehie! –>Alles lyk heerlik en die foto’s is pragtig. Wens ek was daar. Thanks Liandri, I know you’ve always loved this one!